Why Are Chemical Peels Done? The most common use for chemical peels is for sun-damaged skin that has wrinkles, sun spots and age spots. Chemical peels help rid the skin of fine wrinkles, soften deep wrinkles and bleach age spots. Chemical peels may also be useful in other skin conditions that have not responded to previous treatment. Melasma or “the mask of pregnancy” may be helped by chemical peels, as may extensive superficial, smooth, sunken acne scars. Acne may respond nicely as well. It must be remembered that chemical peels are not the “fountain of youth”. The patient must have realistic expectations and understand that more than one treatment session is often necessary. Do not wear make-up, moisturizer, oils or hair preparations for twelve (12) to twenty-four (24) hours prior to your peel. If you have taken Accutane, a six (6) to twelve (12) month waiting period is advisable. Ask us about other medications or preparations to use. Stop all topical medications such as Retin A, Differin and Tazorac, and bleaching creams three (3) days prior to your peel. No waxing or other exfoliations one (1) week prior to your peel. Your skin is cleansed with a cleanser. Your skin will burn and sting slightly. When you look in the mirror, you will see redness and possibly white frost. The white changes fade over the next several hours, but the redness persists for a few days. How Do I Care For My Skin At Home? Gently cleanse with a mild soap followed by a gentle moisturizer i.e., Vanicream, Cetaphil, or Obagi twice daily for the first few days until the redness dies down and the skin begins peeling. Ibuprofen (Motrin IB, Advil, Nuprin) can he used as directed for swelling and tenderness. After several days, a brownish scale develops that slowly cracks and flakes. Avoid picking the scale. Sun avoidance is a must following the peeling procedure. Your skin is more sun sensitive after your peel and daily sunscreens should be used beginning one to two weeks following the peel. How Often Are Peels Done? The first peel is often milder than subsequent peels. Peeling can be performed every three to four weeks, depending on your specific reaction. What Are Possible Side Effects And Complications? If you have a history of frequent “fever blisters” or “cold sores” (herpes infections), you will be prescribed an oral medication for one (1) day prior to or at your procedure to prevent any blisters in the peeled areas. Infection of the peeled area can occur but is uncommon with proper home care. Call our office if pus or thick, yellow crust develops in the peeled areas. Pigment or color changes can occur as either white or dark patches. Olive colored skin has a tendency to form dark patches after chemical peels. These usually fade with time. Whiteheads or milia can sometimes form over healing pores. They often resolve spontaneously or can be easily removed. Sun sensitivity is typical of the “new skin.” Sunscreens are needed to protect you from sunburn, age spots and new wrinkles. In addition, your skin will be more sensitive to windburn and irritants for some time after your peels. Redness can persist for some weeks. This usually resolves with time. Scarring rarely occurs unless infection has resulted. If you have a tendency to form thick, red or tender scars, please let us know beforehand. Blueberry Smoothie is a superficial peel that exfoliates dead skin cells, is an antioxidant, smoothes the skin. It will make your skin smoother and will give your skin a healthy glow without any downtime. 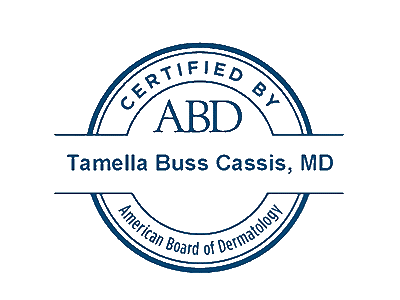 The staff at Cassis Dermatology and Aesthetics Center can perform chemical peels.